Before heading for Springfield a couple weeks ago, I asked a friend at work to tell me which restaurant we should go to for the quintessential Springfield eating experience. Jeff (from work) suggested Charlie Parker’s, a place known for its horseshoes which is a “delicacy” found in Central Illinois and nowhere else (so I’ve been told.) Jeff grew up in Springfield and his family still lives there, so I figured he would be the one in the know. CP’s has been featured on Food Network – Diners, Drive-ins and Dives. If Jeff hadn’t told us about it, we never would’ve found it. Tucked away on an off-the-main-road, primarily industrial side street, even if we had found it, we probably wouldn’t have stopped. The restaurant is in an old quonset hut (originally an airplane hanger in World War II) and that day the parking lot was mostly mud. We weren’t that hungry, so we didn’t get the horseshoe (or even one of the pony shoes), but the grilled cheese sandwich I did get was absolutely delicious – as were the sandwiches and food of everyone else in the family. The horseshoe, by the way, is two pieces of toast, meat (ham, bacon, chicken, hamburger, fish, etc.) on top of the toast, eggs on top of the meat, then cheese sauce (or sausage gravy or both) on top of that, and then a ton of french fries or hash browns on top of all of it. Their pancakes are huge – if you eat four of them, they’ll pay for your meal, but no one has ever done it. They are sixteen inches in diameter and hang off the edge of a pizza pan. Here’s the video of when Guy Ferrari visited there for the show and how they make the horseshoe. Fun to see. For the past four days I have been at Summit from morning to night. Summit is the annual Awana youth gathering where more than 800 teens converged on Pheasant Run Resort in St. Charles, Illinois to have fun, learn about God’s Word and compete in Bible Quizzing, volleyball, AwanaGames and six areas of Fine Arts. For the past several years, I have been head judge for the Creative Writing competition – always fascinating to see what the kids are writing. Kids send us preliminary writing sample and then write a second piece on site. I spent a lot of time this year talking to leaders and kids, finding out what they liked and didn’t like. Also, I checked wrist bands at the volleyball tournament (30 teams eliminated until one was left) and watched the 25 AwanaGame go from 25 to 1. I think someone told me that we started with 120 Bible Quizzing teams. Those were eliminated until 10 teams were left for the platinum round at the closing ceremony and then those went down to one. The speaker, a pastor who grew up in Awana, was extremely good and well-received. All in all, a great time! My annual Texas father and son picture. Teens watching Winnie zoom around the circle. Art and Winnie wait for the wheelchair relay. Happy Birthday, Winnie! This was her 93rd BD. Art (founder of Awana) comes appropriately dressed. The GBC team gets ready for the balloon relay (they came in 3rd of the 25 teams). Anxiously waiting for the next round of games. Buy a game pin. Get autographs. More official judges get officially read for an official Bible Quizzing round. Just a few of the many visual art submissions. A few of the official judges officially stand in the official lunch line. 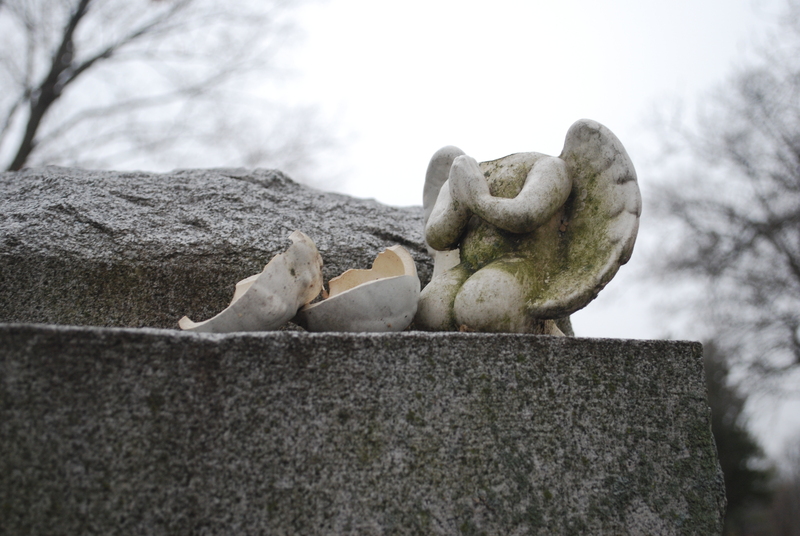 Next to Ann’s grave was a rather sad-looking angel. We stopped at an old fashioned soda fountain for a sweet treat and talked with the lady who served us. We asked her if there were any little-known sites we should see and she sent us up the street to the cemetery where Ann Rutledge (supposedly first love of Abe) was buried. We hesitated, but it was only blocks away, so we went. Take the time to read the poem on Ann’s grave – it is QUITE dramatic. Getting seed pods from the sweet gum tree. Summit is taking over my life. The last two times I have been to New Salem – it’s been in February. Which means that the last two times I’ve been to New Salem, we’ve been the only tourists there. Last time there wasn’t anyone in the village (just in the visitor’s center). This time, there were two “costumed people” in the first cabin. Mostly the kids had the run of the village (well, so did we – but we didn’t actually run). Lincoln moved to New Salem when he was 22 and he lived there for six years. It was here he read law text books and learned to be a lawyer. Also, this was the place that Ann Rutledge’s father owned the tavern – historians have debated ever since whether or not Ann was Lincoln’s first true love. She died of typhoid at age 22 and many say her death sent Lincoln into depression. But no one really knows. A pod from a sweet gum tree. This fireplace is in the one original cabin and is supposedly the fireplace where Lincoln studied. The two “homesteaders” who explained the village to us. 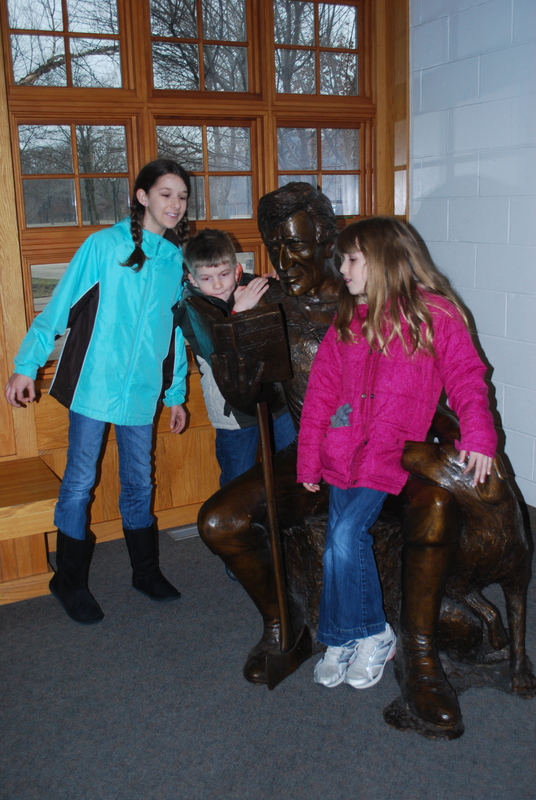 Abe reads to the kids.